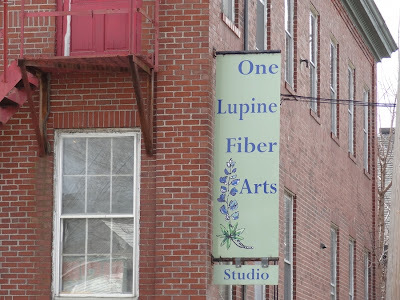 If you've never been to One Lupine Fiber Arts up on "The Hill" in Bangor you are missing out. The two-story shop on the corner of Park & Center is a gem of a place filled with beautiful Maine pottery, jewelry, clothing, yarn, and more. Shop owner Jodi Clayton, a fiber artist, was recently named Artist of the Year at Belfast's Arts in the Park Festival for her hand-dyed silk garments embellished with felted designs. Check them out at the Belfast festival July 7 & 8th or at One Lupine. Congratulations - an award well-deserved!